The Alaska Oregon Washington State Area Conference (AOWSAC) of the NAACP is dedicated to improving the political, educational, social and economic status of all persons, eliminating racial prejudice, and keeping the public aware of the adverse effects of discrimination at the state level. We have 13 local unit Branches and multiple youth councils, high school councils and prison Branches throughout Alaska, Oregon and Washington committed to addressing issues of discrimination and inequality affecting members in our communities and at the state level. With this site, our goal is to provide you with information on local Branch events, and links to current news stories featuring AOWSAC’s advocacy efforts. With the recent Supreme Court decision regarding the Voting Rights Act of 1965, the need is greater than ever for the NAACP to continue our voting rights advocacy and registration program. The Washington State House of Representatives took a momentous step towards dismantling the institutionalized racism in our housing market by passing HB 1453, a bill that would reform the eviction process Tuesday. We applaud all of the lawmakers who voted in support of this measure, but we are deeply frustrated with the lawmakers, in particular those we previously thought of as allies, who voted against this bill. By voting no on HB 1453, these lawmakers voted against the interests of their constituents, especially communities of color. It is even more troubling to hear that many of these lawmakers who voted no on this bill are landlords or related to landlords, and their vote seemed to be motivated more by personal financial interest instead of the well-being of the community. Our laws are designed to lock up Black men through incarceration - and lock out Black women through eviction. If the legislature does not pass eviction reform, then it is clear that neither party is serious about addressing racial inequity, housing instability, or poverty. We are tired of lip service. We demand the legislature actually takes substantial steps towards ending the racism within our housing market - and the first step to achieving this is by reforming our eviction process. Further, we will support efforts to unseat legislators who vote against tenant protections. 1 Thomas, T., Toomet, O., Kennedy, I., Ramiller, A. (2019). The State of Evictions: Results from the University of Washington Evictions Project. University of Washington. 6 Desmond, M. (2012). Eviction and the reproduction of urban poverty. American Journal of Sociology, 118, 88-133. PDF of letter available for download here. The 2019 AAYLC Conference for Linn, Benton, Lincoln and Lane Counties will be hosted by Linn-Benton Community College (LBCC) on Tuesday, April 9, 2019 from 8:30am - 1:15pm. More info to come! Grant Writer? Our branch is in need of Grant Writers to make possible projects important to our community and branch. Please contact Angel if you have experience, or are willing to learn, and have time to give. 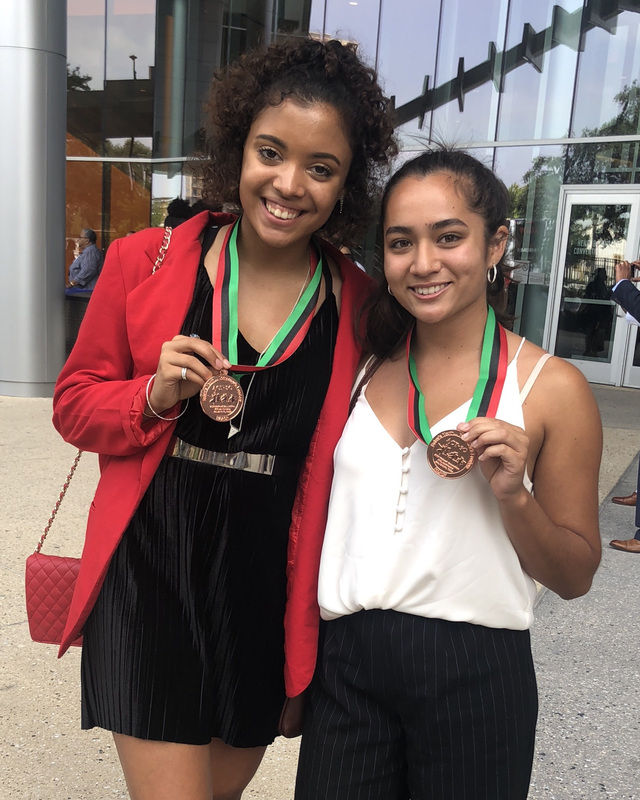 2018 Act-So National Medalists Alaja Badalich and Kilani Afelin!